What's The Right Amount Of Horsepower? The expected answer to the question “What’s the right amount of horsepower?” is usually to bellow “AS MUCH AS POSSIBLE” shortly before lighting yourself on fire and leaping through a plate-glass window. But the question is actually a lot more complex than you think, and with HP ratings generally increasing every year, worth asking. So let’s figure this out. 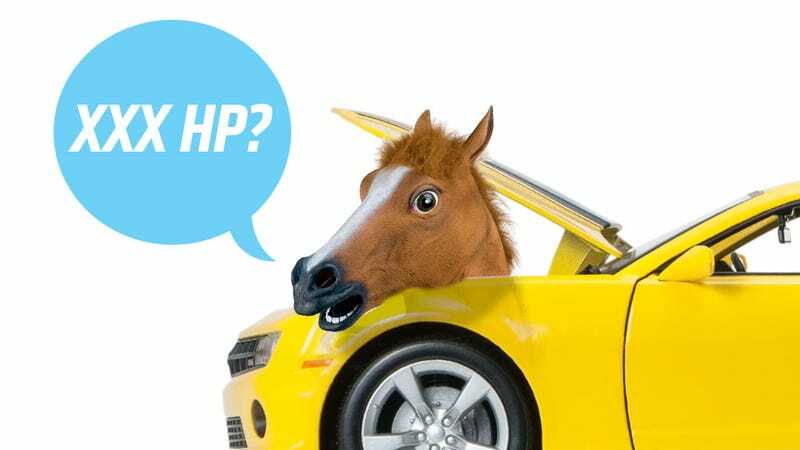 What Exactly Is Horsepower, Anyway? I’ve been thinking about this question for a while, because, really, I’m pretty conflicted. I’ve happily driven low-HP cars (low as in around 50 HP) all my life, and I’ve never had the low output of the cars keep me from doing what I wanted to do, provided that what I wanted to do didn’t involve winning pink slips at stoplights. But I have driven some very powerful cars — ones in the 600-700 HP range — and, let’s face it, they’re a blast. They’re a blast, but they’re also absurd and, outside of a track, almost useless. Most of the times I’ve driven high-HP cars in normal, daily-life contexts, they’ve just been exercises in frustration, and driving became this chore of always holding back and making sure you weren’t releasing the massive potential of the car. It’s sort of like how a friend of mine once very misguidedly attempted to not ejaculate for a month, even though he kept masturbating. It’s not really any fun. Actually, the only time I’ve ever been able to use a powerful car to its full potential on a public road was just recently in Italy, where I was able to wring out a Jaguar F-Type R to insane speeds, but that was only because the Mille Miglia was happening and all regular, rational traffic laws had left the country. But, really, that’s probably the only time I’ve fully appreciated 500HP+ on a public road, even quasi-legally. Average horsepower is steadily increasing. Granted, it’s not at the levels of other quantitative measurements of stuff, like a computer’s CPU speed or amount of memory, but, on average, we get way more horses for our horse-dollar than ever before. The fact that relatively inexpensive cars like the Hellcat can put out an absurd and formerly supercar-only 707 HP is clinically bonkers. An average family sedan has HP numbers once reserved for sports cars, and there’s only two or three cars available with under 100 HP in the US today. Europe tends to get by with much less, or at least will tolerate cars in the 70-80 HP range far better than we will, and they even have more access to speed-limit free roads. So here’s my question, in two parts: What is the minimum HP (in a modern weight car) do you think you need to get around relatively normally and safely? Think about it like what amount of HP would your mom need to live her street-driving life (mom’s dragster is exempt)? Then, what’s the minimum ideal, usable amount of HP for you? As in what do you think the sweet spot is for a modern car? Personally, I think my answers would be — for a car in the 2600-3200 range or so — maybe 80 HP for the minimum, and 250HP for the sweet spot. I feel like I’ve had the most, and most usable fun — on and off track — in cars in the 200-250 HP range. And I know 80 HP would be all that most of the Camry-driving commuters out there would actually, really ever need. But maybe I’m a fool? Maybe I’m some sick, perverted HP self-denier? Maybe I’m a revolting American HP glutton, still? I’m curious to hear what all of you think!